Dungeon Travelers 2 is an erotically-tinged RPG from Atlus that features some women who aren’t wearing much in the way of clothing. There was enough sexual content in the original Japanese version enough that Atlus had to slightly alter the game to avoid an AO rating. Warning: This post will feature screen shots from Dungeon Travelers 2 that could be considered pornographic. Be careful as you continue to scroll. 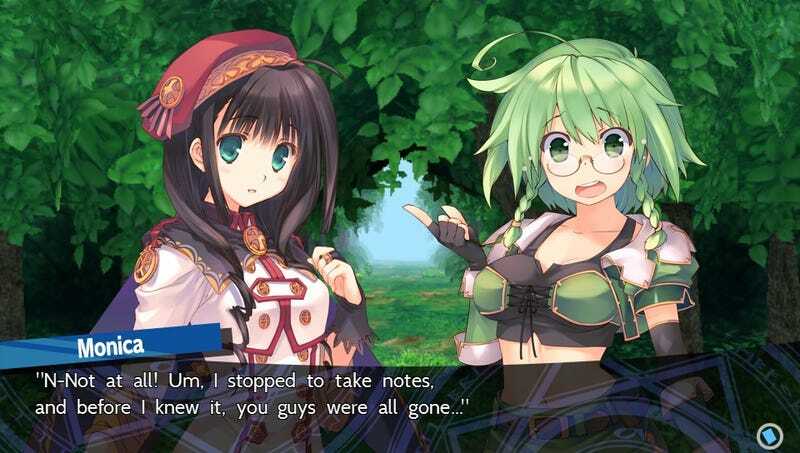 Dungeon Travelers 2: The Royal Library & the Monster Seal presented some challenges during the localization process — specifically, adapting some of the fan service content to western sensibilities. Localization by nature requires some changes to be made for content to be understood en masse, which is why ATLUS worked closely with developer AquaPlus to preserve the game’s themes and content to its fullest. In order to comply with restrictions set forth by rating boards, ATLUS made concessions on just four in-game images. On these images, some minor edits were made (and approved by the developer) to adjust the overt graphics to within acceptable ranges for the game’s M-rating. Dungeon Travelers 2 is a first-person, turn-based RPG in which players are “sealing” monsters in dungeons. These monsters happen to be women wearing very little clothing. While this might represent the extreme end of Dungeon Travelers 2, a game that’s premised around rewarding players with sexual images, you can see why the ESRB might have an issue. We’ll refrain from showing you the images of some of the younger women featured in the Japanese version of Dungeon Travelers 2, but “young” would be a generous term. The ESRB does have an Adults Only rating, though very few games have been labeled as such. AO is considered a kiss of death amongst publishers because of the problems it can cause with being carried by retailers. It’s not a surprise Atlus would want to comply with the ESRB. In this case, Atlus closely worked with the ratings board to determine what was in bounds. Whatever you think of Dungeon Travelers 2 and its imagery, it’s this point that gives fans pause. At what point does editing for demographic and cultural differences become censorship? On the Siliconera article about the game’s alterations, the reaction was mixed. Some were glad to see the game come over, even if it meant a few changes. Others wondered about the different standards for sexual representation in the West vs. East. Below the game’s trailer on YouTube, another fan hoped some game developer would decide to flip the script. For Atlus, it’s a balance between all of its competing interests. They want to please their fans and keep the integrity of the game intact, but there are market and social realities, as well. Fans can judge for themselves when Dungeon Travelers 2 is released this summer.